Okay, bear with me zombie fans because there’s a lot of news today, especially about our favorite new series The Walking Dead, which took the world by storm last night! There’s also a host of great news about the latest in zombie video games. Here’s the info on the zombie walks you may or may not have been a part of this past weekend. 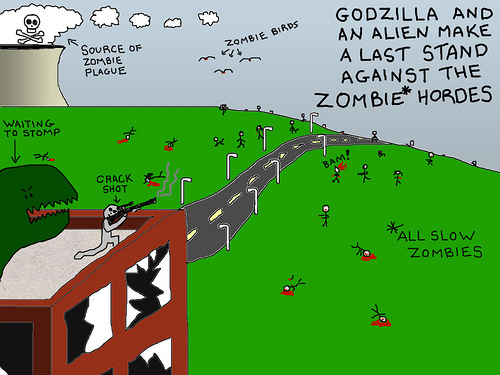 Godzilla doesnâ€™t really remember what it was like before the zombies came. Occasionally, he will get a flash of memory, like the smell of juniper, or the sound of children in a swimming pool. But it fades once the next bullet is fired. What can I possibly add to that? Nothing, that’s what. But I’ll tell you this: I wasted a good two hours on this guy’s Tumbr site, I am your Canadian Boyfriend, and I promise you you’ll see more of his stuff here at some point. You can also find this excellent cartoon in its original context here. When the inevitable zombie apocalypse occurs, we’re going to need some quick thinking to get through it. 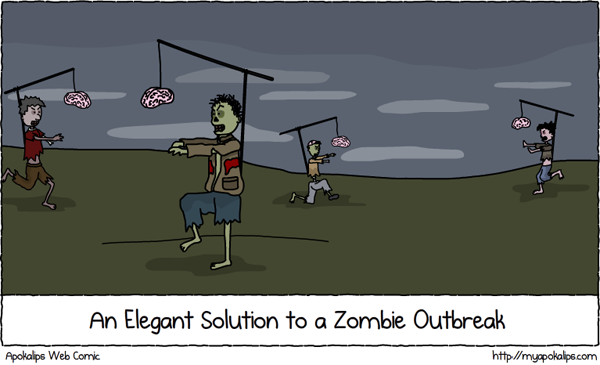 And while I am not sure I want to be the guy that attaches this “brain on a stick” solution to the zombies, one has to admire its inherent sensibility and out-of-the-box approach. You can see this comic here and lots of others at the myapokalips.com main page. 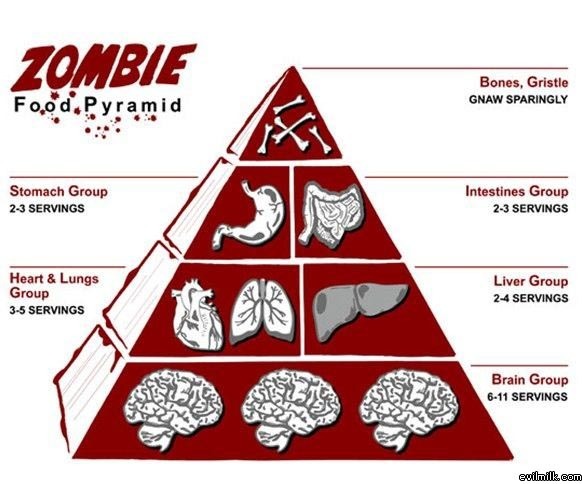 Just because you’re a zombie is no reason to ignore the fundamentals of good nutrition. Sure, we all know the basis for an undead diet is a healthy dose of brains, but what about the rest of their meals? Well, this handy guide should show you what you need to know if you join the ranks of our living-impaired friends. No idea who the original creator of this is, the URL imprinted in the pic is just a funny picture aggregator. If you know the original source, let me know so I can give credit where due.